Go for a ride on the new Nest Swing by Swing-N-Slide. Made with sturdy steel frame and heavy-duty fabric for comfort, this robust swing will have your kids playing for hours on end. This unique design helps to promote teamwork and social skills as it will hold up to 3-children at a time. It is built to withstand a capacity of 200 lbs. and features a round base with strong fabric that will last. The fabric can even be taken off and hand washed. This large 40 in. Dia design can fit in 2-swing bay positions while still meeting ASTM space requirements. Steering Wheels from Creative Cedar Designs are a simple addition to any backyard playset and add an extra dimension of imaginative play to your child's play safe swing set experience. Whether your child is piloting their playset vessel on the high seas or zooming down winding mountain roads, this no-sweat swing set accessory will encourage exploration on any residential play set for years to come. Steering wheel comes packaged with plastic steering wheel cap, swing set accessory hardware and installation instructions. 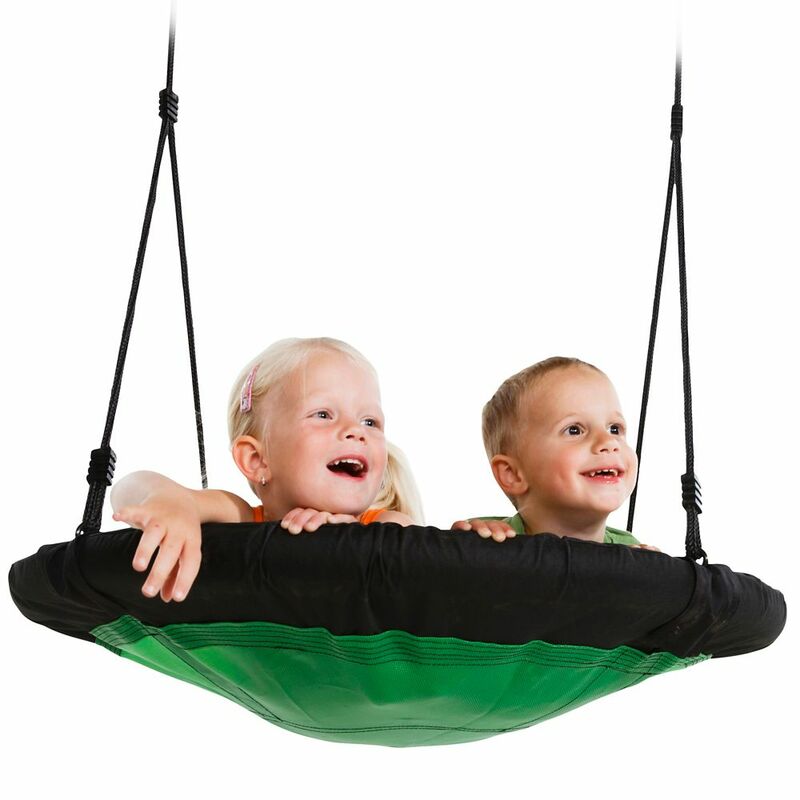 40Inch Nest Swing in Green Go for a ride on the new Nest Swing by Swing-N-Slide. Made with sturdy steel frame and heavy-duty fabric for comfort, this robust swing will have your kids playing for hours on end. This unique design helps to promote teamwork and social skills as it will hold up to 3-children at a time. It is built to withstand a capacity of 200 lbs. and features a round base with strong fabric that will last. The fabric can even be taken off and hand washed. This large 40 in. Dia design can fit in 2-swing bay positions while still meeting ASTM space requirements. 40Inch Nest Swing in Green is rated 4.7 out of 5 by 35. Rated 5 out of 5 by gagasboys from This swing is a big hit with my 3 year old and 1 1/2 year old grandsons. Very sturdy and large e... This swing is a big hit with my 3 year old and 1 1/2 year old grandsons. Very sturdy and large enough for both boys. This swing meets and exceeds my expectations! Rated 5 out of 5 by HomeDepotCustomer from This swing was easy to put together, and the grandchildren... This swing was easy to put together, and the grandchildren love it. Rated 4 out of 5 by Eyob from It’s a nice swing set worth the money spent. ... It’s a nice swing set worth the money spent. Rated 5 out of 5 by nan from Our 3 year old great grandson loves it. Good quality.... Our 3 year old great grandson loves it. Good quality. Well worth the price. Rated 5 out of 5 by Kathryn from Love this swing, great for all ages!... Love this swing, great for all ages! Nest Swing is design to hang from an 8' high swing beam.